Objective: This study aimed to determine the opinions of family caregivers on the use of physical restraints in patients admitted to intensive care units. 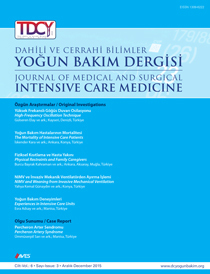 Material and Methods: This descriptive study included the caregivers of 42 restrained patients admitted in Medical and Surgical Intensive Care Units of the Hacettepe University Adult Hospital between August 2012 and August 2013. Data was collected using a data collection form developed by researchers based on the literature. Descriptive statistical analyses and chi-square tests were used for data analysis. Results: The mean age of patients was 41.2±11.2; 52.4% of the patients were females. Among the caregivers, 61.9% were the patients’ children. In this study, physical restraints were applied to the upper extremity alone and to both wrists and ankles in 90.5% and 9.5% of the patients, respectively. Among the relatives, 78.6% stated that they were informed of the physical restraining; 90.9% stated that the information provided was adequate. In addition, 85.7% of the relatives reported that physical restraint on the patient was necessary, 9.5% of the relatives stated that it was unnecessary, and 4.8% of the caregivers were ambivalent regarding the requirement of physical restraining. Only 8.6% of the patients suggested that their presence next to the patient in the intensive care unit may be a substitution for physical restraint. Informed consent for physical restraining was obtained from only 9.8% of the caregivers. Conclusion: Most of the caregivers were informed about physical restraining, and they thought that it was necessary; however, it was determined that informed consent was obtained from only a small percentage of caregivers.